As the Trans-Alaska Pipeline System (TAPS) neared completion, the Legislature turned its attention to the oil and gas tax structure. In 1977, lawmakers adopted the Economic Limit Factor (ELF) as a means of taxing producers based on the productivity of each field. In 1978, the Legislature adopted the separate accounting method in the calculation of the state corporate income tax. In an effort to increase constituent contact and allow more Alaskans to participate in the legislative process, lawmakers created regional Legislative Information Offices during this session. In January 1977, state-funded TV coverage of the Legislature began as well. The Legislature also redesignated public school and Mental Health Trust lands as general purpose grant lands, and at the same time established a separate mental health fund. These actions would create issues for future Legislatures. Lawmakers created a number of new entities including the Alaska Coastal Policy Council, the Alaska Oil and Gas Conservation Commission, the Alaska Gas Pipeline Authority, and the Commercial Fish and Agricultural Bank. In 1977, Legislators adopted the official Native handicraft symbol-the Silver Hand, and created the Alaska Youth Hostel System. 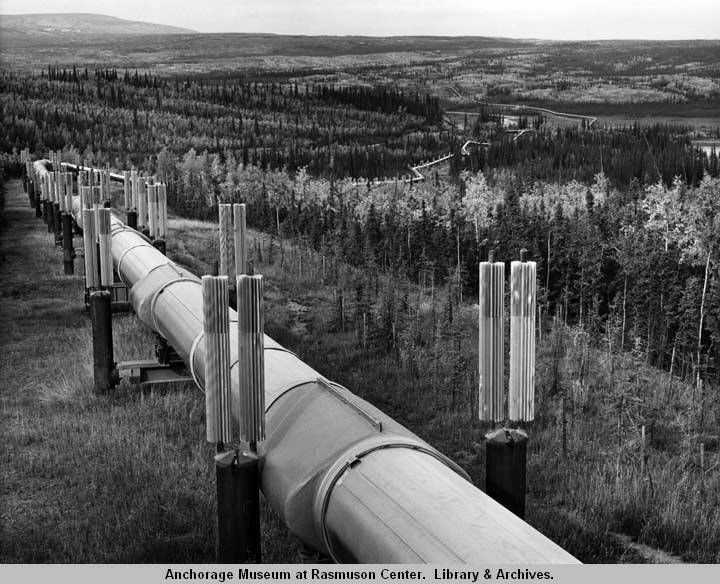 The 800-mile Trans-Alaska Pipeline, which required 515 federal permits and 832 state permits, is completed and on June 20, 1977, the first oil flows through the pipeline. On August 1, 1977, the first tanker of crude oil leaves Valdez. Shortly after oil begins flowing through TAPS, the State goes to court in Alaska v. Amerada Hess, charging oil producers with underpayment of the state's royalty share of production. Following 18 years of litigation over various issues, the case, which has been renamed Alaska North Slope Royalty Litigation, concludes with a final settlement in 1995. Reverend Jerry Falwell founds the Moral Majority. George Lucas' original Star Wars is released in theaters. President Jimmy Carter establishes the Department of Energy. President Carter signs the Torrijos-Carter Treaty, which sets in motion the process of handing the Panama Canal over to Panama.